CANTON, Mass. 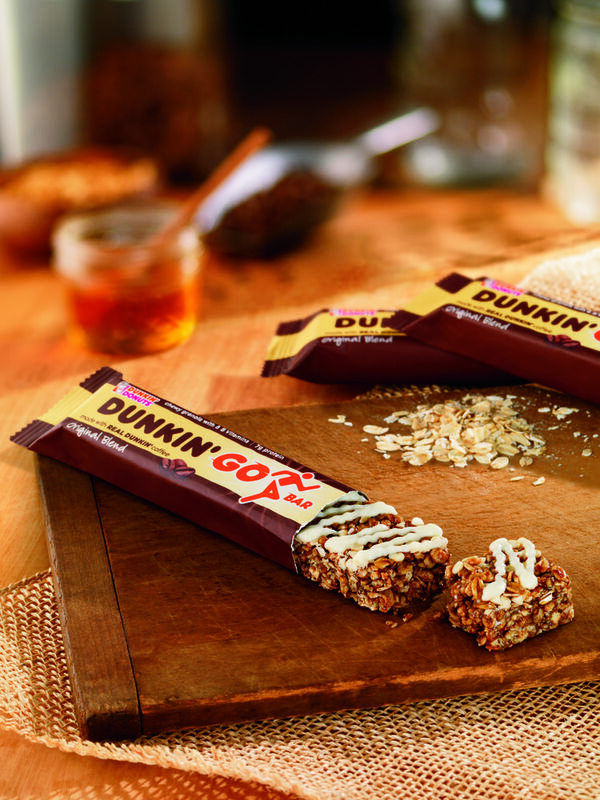 (September 25, 2014) -- Dunkin’ Donuts is “raising the bar” with new grab-and-go snack choices for its guests, today introducing the new Dunkin’ Go Bar, a pre-packaged, chewy granola bar made with the famous flavor of the brand’s Original Blend Coffee. At only 220 calories with seven grams of protein, eight B-vitamins and 12 grams of whole grains, the Dunkin’ Go Bar is a convenient snack for people who are busy and on-the-go. Dunkin’ Go Bars will be available at participating Dunkin’ Donuts’ restaurants beginning on National Coffee Day, Monday, September 29. The new Dunkin’ Go Bars will be sold exclusively at the counters of participating Dunkin’ Donuts restaurants, as a permanent part of the brand’s grab-and-go menu. In recent years, Dunkin’ Donuts has expanded its snack options offered at its counters, including bananas, cups of MUNCHKINS® donut hole treats, and more. To further enhance the brand’s grab-and-go options available for guests, Dunkin’ Donuts today also announced a new partnership with Wrigley Foodservice to make Orbit® gum and Altoids® mints available for purchase at participating Dunkin’ Donuts restaurants throughout the U.S. Altoids mints and Orbit gum will be sold from a customized display that also features the new Dunkin’ Go Bar and other grab-and-go items. The partnership is effective beginning October 1. To celebrate the launch of the new Dunkin’ Go Bar, Dunkin’ Donuts is giving its Twitter fans the chance to win JetBlue travel vouchers for a trip anywhere they most want to go. As part of today’s special “DunkinGO” Twitter Sweepstakes, people can tweet @DunkinDonuts which U.S. city they most want to go to with a friend. People who participate, using the special hashtag #DunkinGOsweeps, are entered for the chance to win one of five $50 Dunkin’ Donuts mGifts. One grand prize winner selected from all participants will receive two JetBlue travel vouchers. No purchase necessary, 18+ to enter. For official rules and additional information related to the “DunkinGO” Twitter Sweepstakes, visit http://dun.kn/1psxTTe. Dunkin’ Donuts is the exclusive coffee provider of JetBlue, with Dunkin’ Donuts coffee and tea served on-board all JetBlue flights throughout the Americas.